We're super excited each time we manage to find a very unique iPhone 5 case that's designed like never before. It's refreshing to say the least. 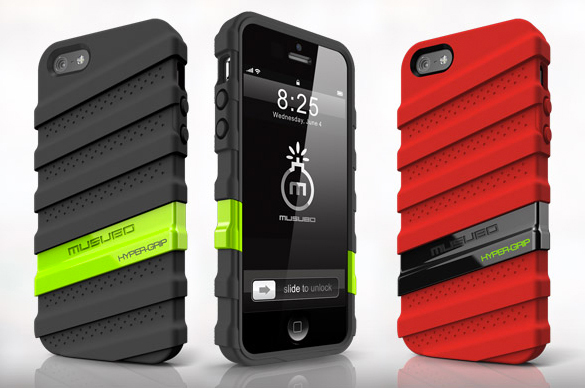 The HyperGrip case for the iPhone 5 by Musubo is one unique looking case. The design mimics the wrapped handle of a tennis bat which of course means this case is all about giving you a bunch of tactile grip and extreme, sporty style. The HyperGrip case is made from durable silicone with what looks like a glossy hard, polycarbonate mid-band that adds a contrasting color as well as additional support and protection. Musubo is known for its wild and unique case designs, and this is no exception. You can grab the HyperGrip case for $30, and it's available in five colors.